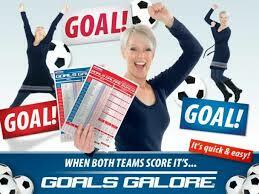 The best system in Goals Galore in my opinion is to pick either a 4 or 5 match accumulator. My preference is for the 4 team accumulator, that has been my most successful strike rate and I've never deviated from this method. My bookmaker of choice has always been Betfred with them offering fixed odds of 9/1 for a four match bet and 16/1 for five matches via there Goals Galore bonus coupon. Okay, you have your coupon in front of you and there can be around forty matches in the four English leagues to choose from. I then try to narrow them down to make a shortlist before I've studied any form whatsoever. Right then, how to narrow down the matches........ I've got a simple way that works well and is fairly quick to do, basically you look at each matches prices for a home win, you need to find matches where the home teams odds are between 11/10 and 5/2, all matches like this go onto your shortlist. Once you have completed the process explained above you now have your shortlist which you now need to bring down to your final selections, whether you decide to back four matches like myself, five matches or however many matches is down to your choice. I suggest you use a Saturday newspaper, my preference is always The Sun....... In the 'Favourite' horse racing/football pullout you will find the four English league tables which contain both home and away form and goals scored stats both for home and away matches. Using matches on your shortlist go through the form of the home side and away side. As an example I'll say Everton v's Arsenal, now firstly you want to look at Evertons record of games at home and goals scored/conceded in those home matches. Once you have looked at the home team you then do the same for the away team, in our case Arsenal but as I said as they are away you look at their form for matches played away. If using your judgement of both teams home/away form you feel that it is likely both teams will score then that match goes from your shortlist onto your final selections list. You continue and repeat the process for each match on your shortlist and it really is as simple as that. Okay, when i'm looking at the home teams record of goals scored or conceded at home I am then looking at the amount of games they've played at home, so for instance if the home team have played let's say 10 home matches and scored 23 goals and conceded 13 goals, I can see they are averaging 2.3 goals scored per home match and on average are conceding 1.3 goals. I'm always looking for teams that are averaging around or over 2 goals scored per game and are conceding around an average of 1.2 goals. It's exactly the same format for the away team except I'm looking for averages of around 1.5 goals scored and 1.2 goals conceded as the away team doesn't have home advantage. That is pretty much the way I make my own selections. Please also be aware that I will be sending you my own selections each Saturday where there is an English league programme of matches. Selections will be sent in an email by midday. These rules are for both teams to score or over 2.5 goals? Place your cricket betting on International matched, sportsb8 is a top online sports betting Site in India provide the all matched betting . Very good blog about goals galore. check our cricket betting tips site for a best cricket betting session. for your own bottom line profits!